A printing office in a village like Newton, however humble in pretension, a year ago would have been considered one of the greatest wonders of the age. Wonders do, however, occasionally appear, and one of the greatest we Know of is the conversion in such a place, of a building larger than the establishments of the Metropolitan morning papers, or of the printers to Her Majesty, into a place for pressmen and printers devils. So Mr. George McCorquodale, originally in business at Liverpool, contracted in 1846 for the Railway Companys printing and stationery work. To day, after 90 years, this work is still the main output of the Newton works. The Legh Arms Hotel was a large three floor building with a number of remarkable cellars. It is interesting to note that three of these old cellars, each 150 feet long, are used for housing standing formes. 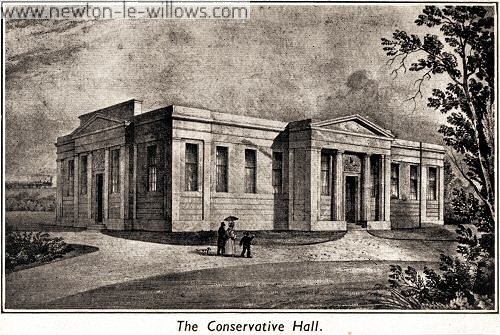 The Conservative Hall, built in 1835, being on sale, was acquired by Mr. McCorquodale in 1846. An admirable drawing of the interior of the Hall with employees at work, by the late Frederic Shields, A.R.W.S., who, as a young man was employed at the Works, is very interesting. The land occupied by the Conservative Hall, and extending to Southworth Road on the north and Station Road on the west, covering 3,946 square yards was leased from Lord Newton in March, 1847. In February, 1854, a lease was taken of the old Legh Arms Hotel site, with land fronting same to the railway, also a strip, 30 yards wide with a depth of 170 yards, behind the Conservative Hall, running north through to Southworth Road?a total of 7,077 square yards. Further land behind the above and extending along Southworth Road, to the extent of 24,412 square yards, was leased in June, 1872. In these early days, gas was manufactured at the Printing Works and from 1855 was supplied to the township until such time as the Gas Works was in a position to make sufficient for the district. On February 16th, 1865, a disastrous fire gutted the Hotel, only the great red sand stone and rubble walls?two feet in thickness, remaining. It was, however, soon rebuilt and the accommodation greatly improved. Another fire occurred on April 7th, 1871. Fortunately, this was confined to part of the Conservative Hall, used as the Machine Room?a number of machines and presses were destroyed. Although, after the 1865 fire, the interior of the Hotel was remodelled it became necessary to enlarge the factory, and various extensions were made and additional buildings erected from time to time. 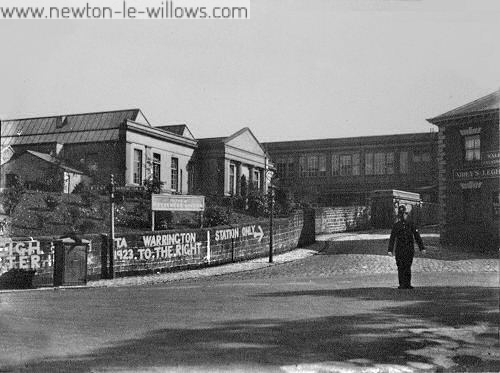 When the Leeds branch was opened, the staff and plant of the Lithographic Department was transferred from Newton. Letterpress ink has been manufactured at Newton since 1894?the various grades comparing favourably with other makers as regards quality and price. 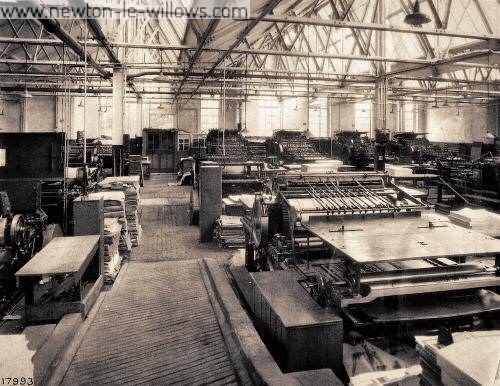 The Envelope Department was closed in 1908, the machines being transferred to Wolverton. From 1920 to 1923 great structural alterations to the buildings were carried out. The Composing Room and part of the adjoining L.M.S. Stores were rebuilt?the arches carrying the old ” Slide ” passage were demolished during this alteration. The Machine Room (old Conservative Hall) was next re roofed, the east wall being demolished?thus throwing the Machine, Binding and Ruling Rooms into one?the new roof was extended over these Departments?the whole joining up with the new Composing Room roof. All these alterations to the buildings were carried out with little interference to the work of the factory. Low temporary wooden ceilings, covered with tarpaulin, were erected as the building operations progressed. On the completion of the Machine Room alterations, a mosaic tablet, in the form of a compass, with the date ” 1921 ” was fixed in the main passage. Early in 1921, it was decided to demolish the old Hotel building?and during a week end, the office furniture, books, stocks, safes, etc., were removed?the Cashiers Office to the old Court Room behind the present Legh Arms Hotel, and the General Offices to the Warehouse, surrounded by the Monotype, Stereo and Binders ! As much of the paper stock as possible was transferred to the Hotel stables. Over three thousand tons of sandstone and rubble from the walls of this old building were dumped into the “Penfold” in Willow Bank. The new building of two floors was completed the next year. By the removal of several of the old cellars a splendid paper store was made?in the upper floor are the Offices and L.M.S. Despatching and Stores Departments. Another large building of one floor, on the north side of the Works, was erected in 1925 6, which houses the Engineers, Joiners, Waste Paper, Ticket and Varnishing Departments. A large Dining and Recreation Room is also provided in this building. On its completion, the various old buildings were demolished. Both these buildings have flat concrete roofs?capable of carrying additional floors should it be necessary. At this time, electricity was installed, and the steam and gas engines closed down. The electric equipment is by The British Thomson Houston Co. Ltd. and power is obtained from the Lancashire Electric Power Co. The total rated H.P. is 423. Total number of motors, 96?76 individual drives and 20 on shafting. Upon the installation of Sprinklers in 1924, the Works Private Fire Brigade was, by arrangement with the Insurance Company, reduced from 12 to 7 members. Including the Clerical Staff, the number of employees is 208 males and 166 females. July 30th, 1929, was a red letter day for Newton, when the Chairman, Mr. A. C. MCCorquodale, distributed gold and silver brooches to two female employees, and gold and silver medals to 11 male employees with over 50 years service, also silver brooches to 12 females, and 84 silver medals to males with over 30 years service. Presentations have since been made by Directors to 17 employees upon completing 50 years service, and 37 employees with 30 years service. In this short survey of the growth of the Newton Works?the home of the Firm?it is perhaps permissible to refer to certain events in the life of the village in which Mr. George MCCorquodale?his family or employees were prominent. In 1852, the Mechanics Institution was started at the Works, and continued there for 12 years?the membership in 1861 being 60. From a meeting held on December 12th, 1859, arose the formation of a Volunteer Rifle Corps, the 73rd?known as “MCCorquodales,” later as a company of the Liverpool Press Guard, which battalion Lieut. Col. George MCCorquodale commanded. A troop of the Lancashire Hussars was raised from Newton in 1859, and it is interesting to note that one of the officers in 1886 was Lieut. Harold MCCorquodale. With St. Peters Church the MCCorquodale family have many connections. The organ was erected to the memory of Louisa Kate MCCorquodale by her husband and children. The Foundation Stone of the present Chancel was laid by Mr. Geo. MCCorquodale on May 10th, 1892. On July 16th, 1895, the founder of the Firm died and the Nave was rebuilt to his memory by his children. The Church was re opened on April 24th, 1898, by the Bishop of Liverpool. The beautiful seven light East Window was placed in the Church, also to his memory, by the people of Newton in 1899. A three light Window in the North Aisle is also dedicated by his wife Emily. Fixed on the North Wall is a gunmetal plate to the memory of Hugh Stewart MCCorquodale who fell at Spion Kop on January 24th, 1900. JOSEPH L. WOOD, 1882 1907. FRED. J. WOOD, 1907 1915. Than Newton le Willows, the place of my birth. But it cannot supply the endearments of home. So sang our village poet, who was also a printer and author. And on this lyrical note we offer a short explanation of our heading for the edification of our colleagues of the other Houses, of which, perhaps, only an aggregate of 2 per. cent. have ever visited Newton. At the inauguration of the Magazine it was decided to try and find an illustration which would symbolise each particular branch. The building in the centre is the original Hall in which the Founder of the Firm first started the actual printing business in 1846, and which looks much the same to day. To make the composite picture we incorporated the village church, which is near the Works and is where the Founder and his family worshipped. A suggestion of the picturesque Newton Mere with the historic three treed Castle Hill on its banks, together with the handsome modern Water Tower, complete the picture. Apropos to the above, there are other and just as interesting landmarks in Newton but these are the main ones in the vicinity of the Works, and this leads to another necessary explanation below. To satisfy the eagerness of some Newtonians to see the history of the Newton Works chronicled and who might wonder why it is not included in this issue, it is due to them to explain that it was decided to leave the historical to the second issue, when Newton will have pride of place on this topic, with the other branches following in turn in subsequent issues. As the general idea of the Magazine is to let each House know something of what the other Houses are doing, it would seem apt to first of all give a list of our departments as some guide to the work produced here. The special activities of certain of the above departments should prove interesting to our co members and will be fully described in a later issue. This is the new name for the Colour Card Department. The new Company came into being on October 1st, 1946, and was formed ” To acquire and carry on the business of colour card and pattern manufacturers,” and has its own Board of Directors, with the Head Office at 15, King Street, London. Whilst thoroughly vetting the first issue it was with an inordinate sense of relief that I read that no search was to be made for a G.B.S., and thereby realised the aptness of Eliza Doolittles famous phrase in relation to the idea, which, after wading carefully through the articles and seeing the infinite variety of style, is obviously unnecessary. Already we see that delving into the past can be enter taining, and no doubt the wonderful progress of the Firm will be detailed in later issues. I feel, however, in a kindly sense of course, that a brighter way of describing, for instance, Beechy Bucks, might have been to quote from Gillie Potters radio essay, in which he jests of ” that salubrious stretch of the Grand Union Canal between the Gas Works at Fenny Stratford and the Carriage Works at Wolverton.” A leaven of ancient usages and customs against the racy pars, with an eyeful of lovely womanhood and beautiful country scene, balance the production admirably. So, without any inference of lack of classical appreciation among the printing fraternity, I feel the possible risk should be avoided of being termed pedantic poseurs ponti ficating on the pons asinorum. The Newton le Willows house is the original home of the Family and the Firm, where the Founder, Mr. GEORGE MCCORQUODALE first started actual printing by acquiring the Conservative Hall, once headquarters of the South Lancashire Conservative Association, from Lord Newton in 1846. The frontage of the hall is much the same to day as it was too years ago when presses were first installed, and this part of the Works is still the Printing Department. 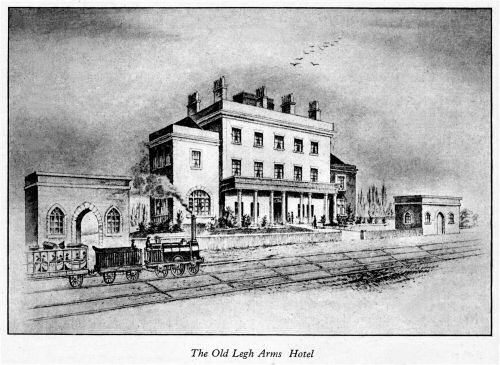 To the Conservative Hall was soon added the old Legh Arms Hotel, which adjoined the Hall, but actually stood alongside the railway itself, its pillared main entrance facing south, leading straight on to the station platform, as can be seen in the picture. It needs little imagination to appreciate the great convenience and enormous saving in cartage when goods can be taken out of the works straight on to the railway. A lease was taken of the site of the Legh Arms Hotel in 1854, and , this large three floor building merits fuller description if only on account of its number of remarkable cellars ; these are 150 feet long, deep down in the sandstone rock below the station level, with vaulted arches, and must have contained a very large stock of wines, etc., when in use as an hotel. The vaults, as they are now referred to, open straight on to the Composing Department, and have been used for a great number of years to house standing formes and were also an ideal ready made air raid shelter during the recent war. Both the Conservative Hall and the Hotel suffered vicissitudes, as in 1865 a disastrous fire gutted the hotel, only the great red sandstone and rubble walls, 2 feet in thickness, remaining. “I was about to rush up the stairs to secure my papers while there was yet time, but was prevented by Mr. McCorquodale who was walking up and down the terrace quite coolly, and who sent me to stop the Warrington Fire Brigade which came too late to be of service ; and so the archives were lost?hence the value of `memories. Another fire occurred in 1871, which was, fortunately, confined to only part of the Conservative Hall used as the machine room. Immediately steps were taken to cut off the communication between the hotel and the hall, and this was ultimately effected by destroying the gangway connect ing the two establishments and by barricading the doorways with reams of paper. The only machines destroyed were a few used in the envelope making and paper ruling rooms but the extensive stock of paper was completely destroyed. Further land alongside and behind the hotel was leased in 1872, and on part of this land are the Firms six cottages and ” Willow Bank,” the residence of the Manager. For over 50 years the whole hotel building was used for offices, as the production of Bradshaws Continental Guide required three translators continuously on the premises, and the old large L. & N. W. Railway Time Table, then issued monthly, also required a staff of Railway Time Table officials to check proofs on the spot, and this necessitated an office for a morse code signalman with direct line to Euston, from which the main clocks of the district were synchronised by the operator waving his hand at his window exactly at 10 a.m. each morning. When the main Railway Timing Office was centred on Crewe, the officials departed, and a few years later the building was demolished and the present offices and stores erected on the same site. 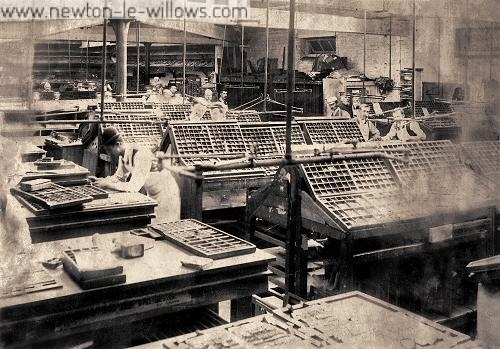 Originally printed by McCorquodales Printers as : “McCORQUODALE & CO. LTD. NEWTON LE WILLOWS. 1846 1937.” printed MAY, 1937.